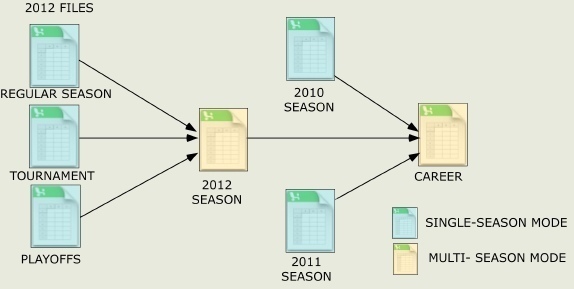 Career statistics can be created from one or more Single Season team worksheets. 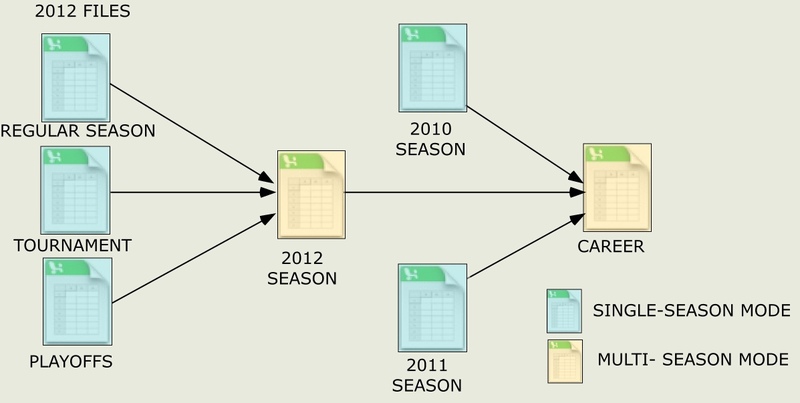 This is accomplished by using the File / Import Stats command with a team worksheet configured in Multi-Season Mode. Individual game-by-game stats from each file are combined into season statistics for each season. Batting Leaders can be generated as well as a web site for the career stats. This web site can be linked back to the main team web site. The importer will test for possible duplicate player name entries during the import process. This might occur if a player was in the active roster in one season and in the expansion roster in another season. These instances will be marked and reported at the completion of the import process. 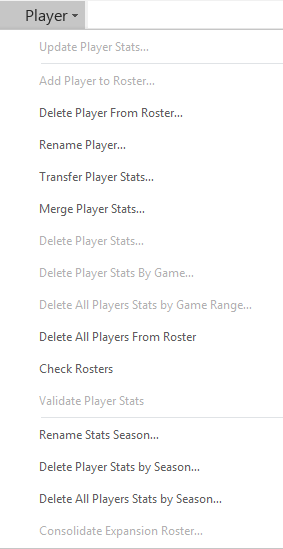 Additional commands in the Player menu facilitate common maintenance issues that can arise from creating career stats. Commands applicable only in Single Season mode are not available. A Multi-Season Mode team worksheet can also import other Multi-Season Mode team worksheets. In this example, separate game stats for the 2012 regular season, playoffs and tournaments are kept in separate Single Season team worksheets and then collated into composite 2012 season stats. The 2012 season stats are then merged with other seasons to create the career stats.